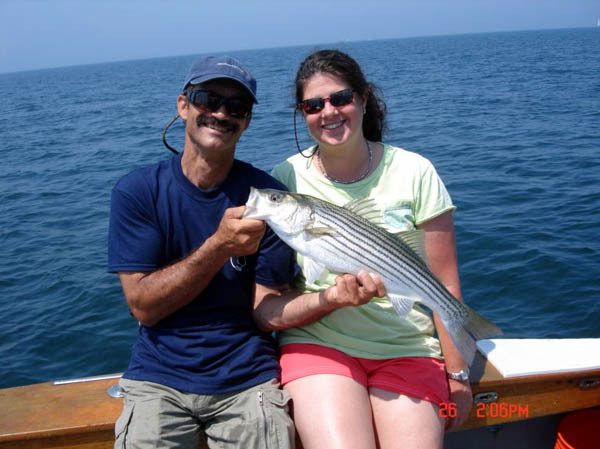 Check out our extensive collection of Rhode Island Fish pictures there are some very nice ones from our various charter fishing trips. 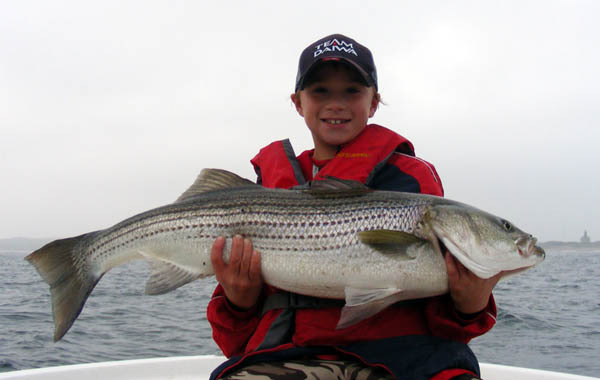 We try to update the pictures as often as possible but we get very busy fishing in Rhode Island so it doesn't always happen. 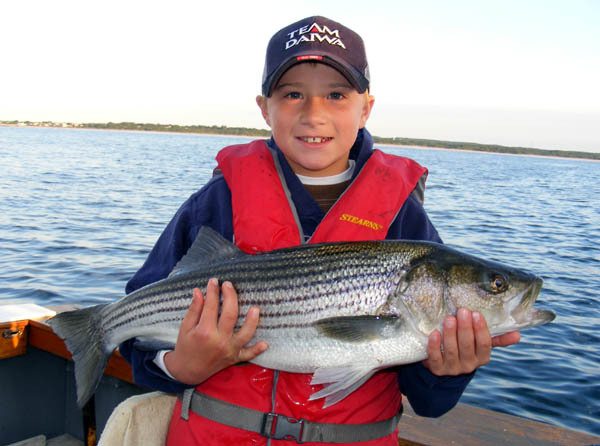 So feel free to check out our RI fish pics. We have a lot of them. 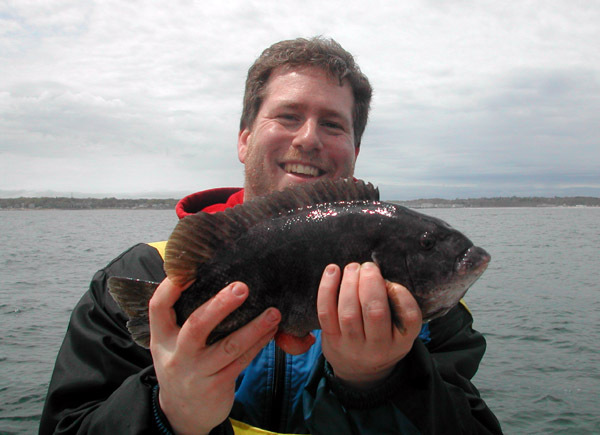 We can fish for Tautog like the one below starting April 15th. 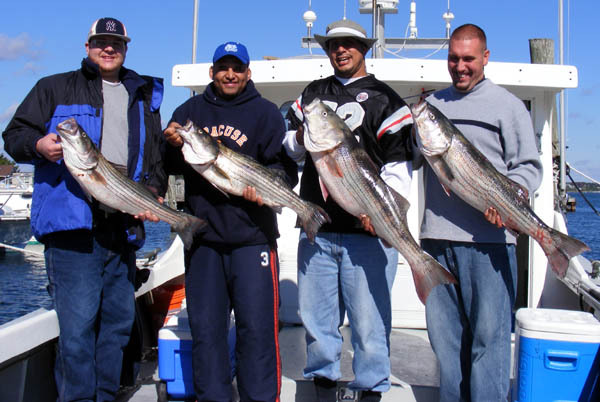 You can see that the 2007 season was a very good one for us, there are a lot of pictures of happy people below with the fish they caught. 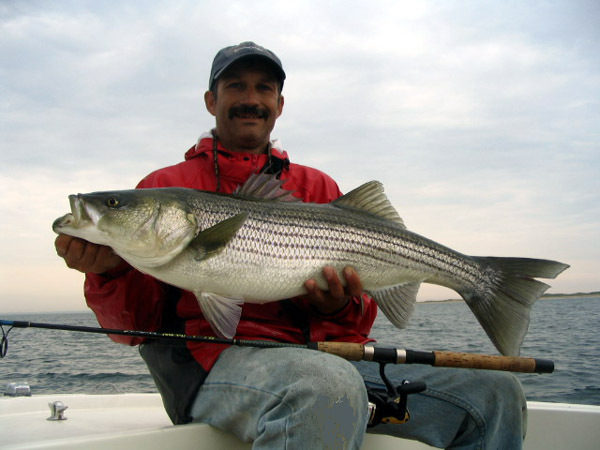 Its especially fun to take people fishing who fish fresh water or have never fished before, they are always amazed at what we catch. 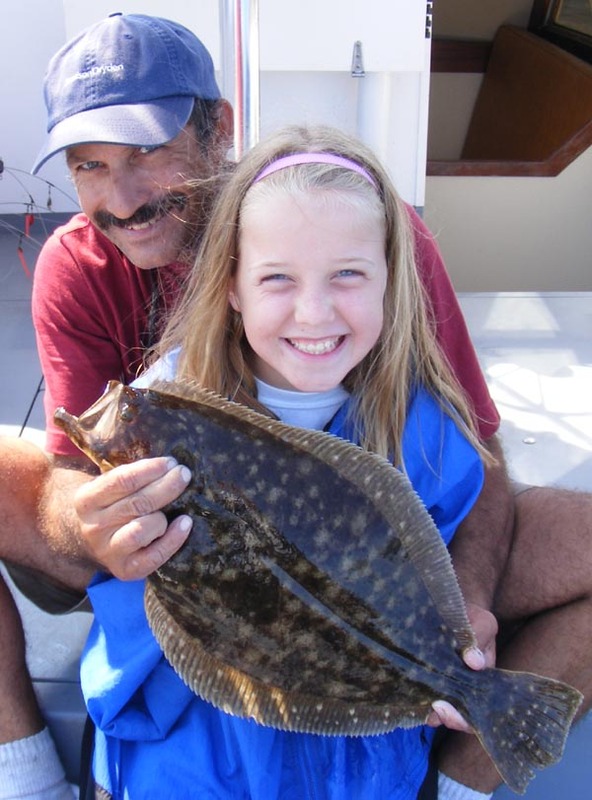 Our most popular family trip is a flounder fishing charter. 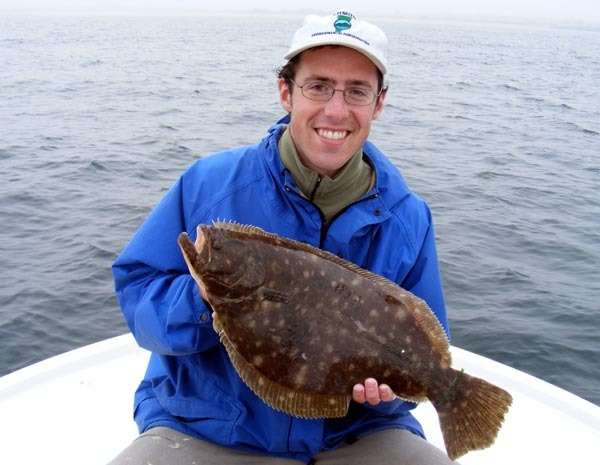 There are some big flounder, very large bass, and many others. This season we started using a new charter vessel, a 33' Webbers Cove downeast style lobster boat. This vessel has agreat ride and is very fuel efficient, and we diod a lot of trips during this season. My dad still runs this boat for 2013. October 22, 2007. 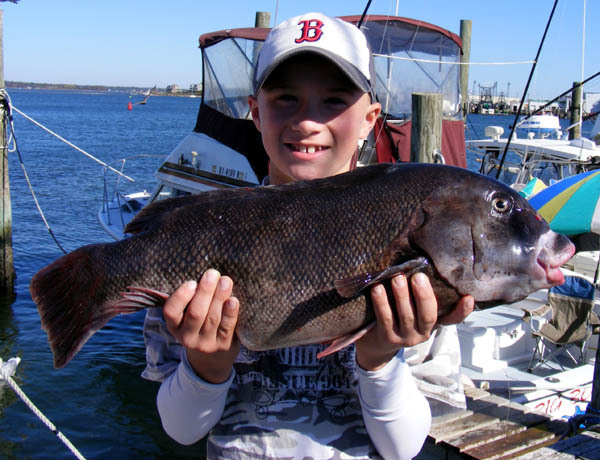 Zach Holds a Giant Tautog he hooked and fought to the boat. The fish tried to pull him into the water. Captain Chris took this group of 4 people out. October 22, 2007. 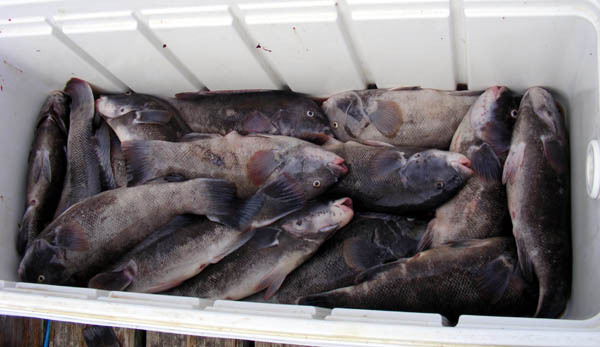 Full limit of 10 Tautog per person was caught this day. October 22, 2007. 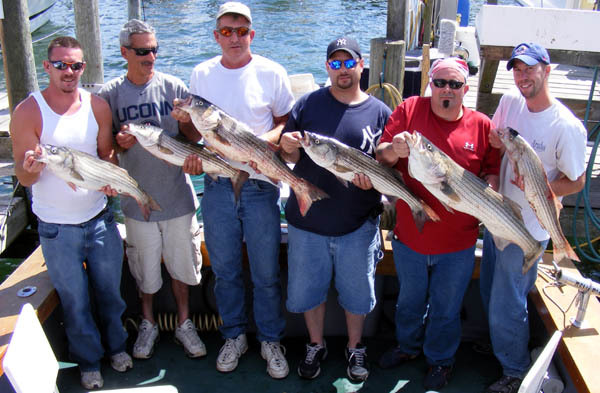 Just a few of the 40 keeper totaug caught on this trip. 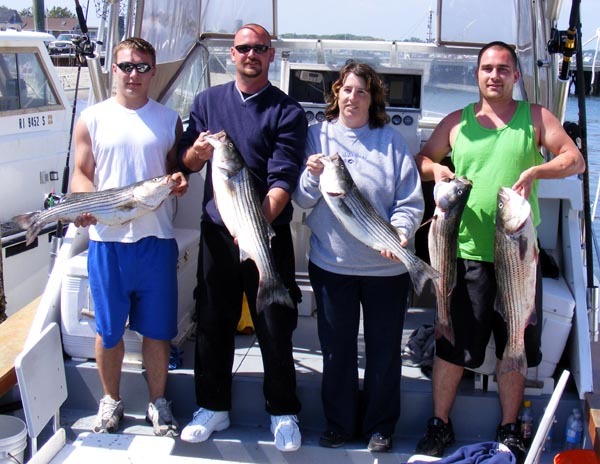 (full limit of 10 fish per person, there were 4) Total 54 fish, 45 keepers could only keep 40. This was captain Earl's Trip. October 22, 2007. 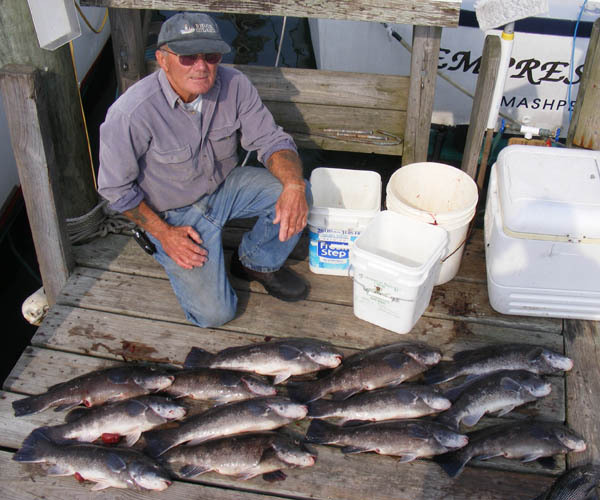 The large cooler with 30 keeper totaug. October 19, 2007. 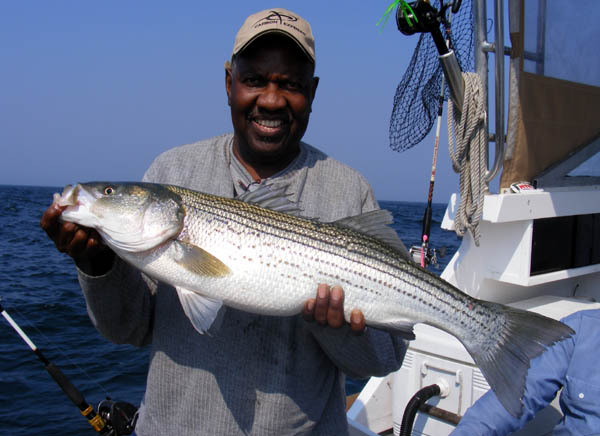 Captain Earl with the Totaug caught during this 5 person trip. The season is open now! 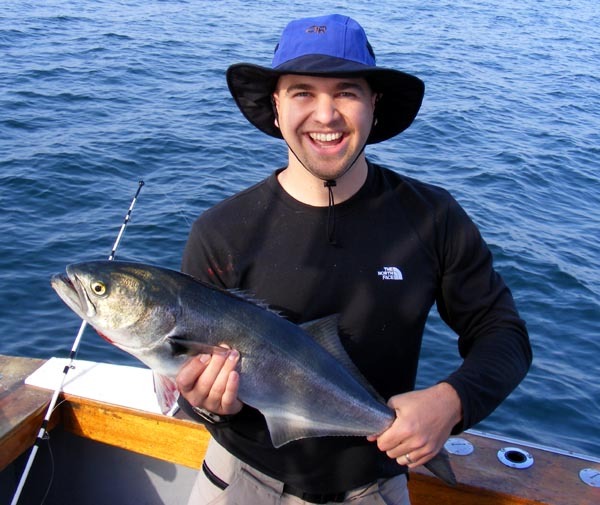 Webber Cove Light tackle trip. 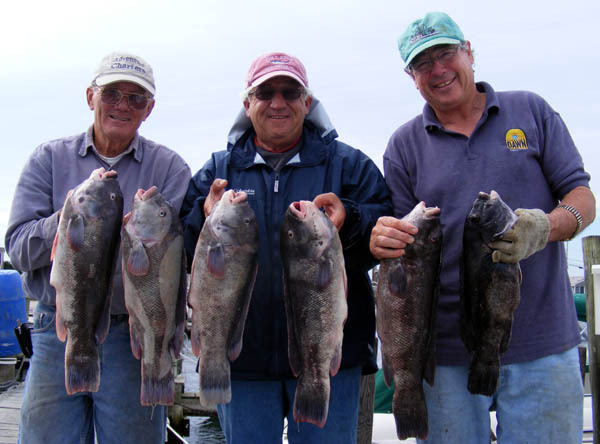 These fish were caught on 17lb class rods. Webber Cove 33 fishing boat. all by himself on a 17lb class spinning rod. Good job Zach! 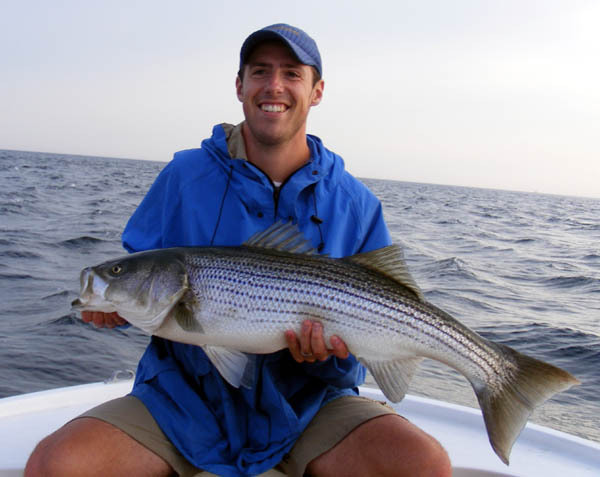 October 4 2007: Captain Chris with a nice Bass caught along the South shore. 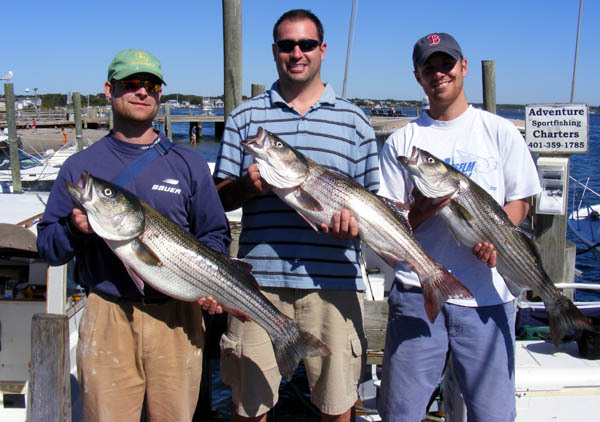 September 23, 2007: Robert and his friends are pleased holding some of the bass they caught at Block Island during a light tackle trip using topwater plugs. 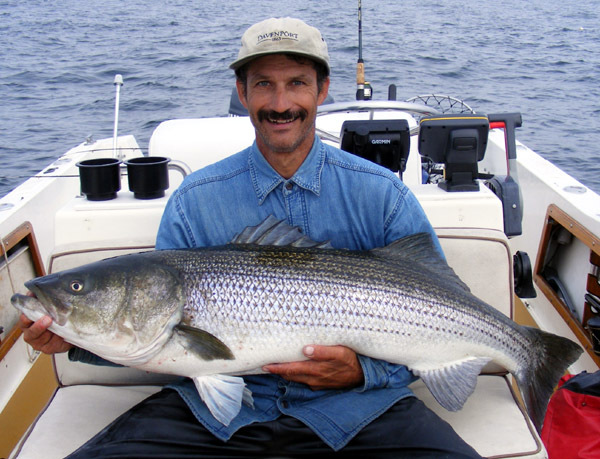 September 21, 2007: Captain Earl holds a nice 29lb Block Island Bass. 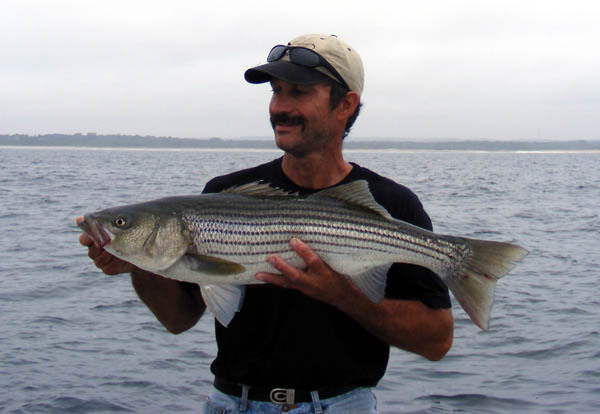 September 17, 2007: Captain Earl with a beautiful 35lb Block Island Bass. This female was released unharmed. 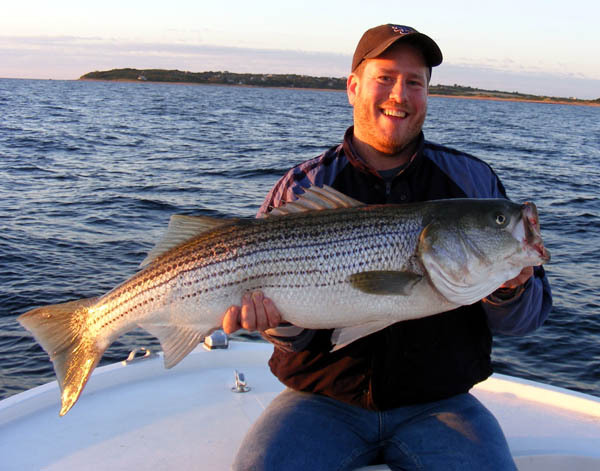 September 17, 2007: Captain Chris with a nice 30lb Block Island Bass. September 11, 2007: A nice 20lb bass that had a taste for a soft plastic shad. 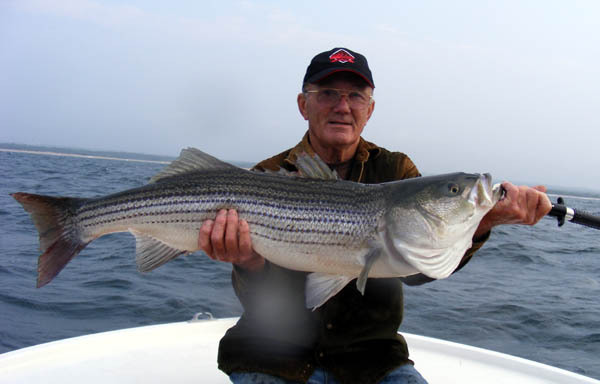 September 11, 2007: Dave Wall with a nice 24lb bass caught on a 12lb class spinning outfit. 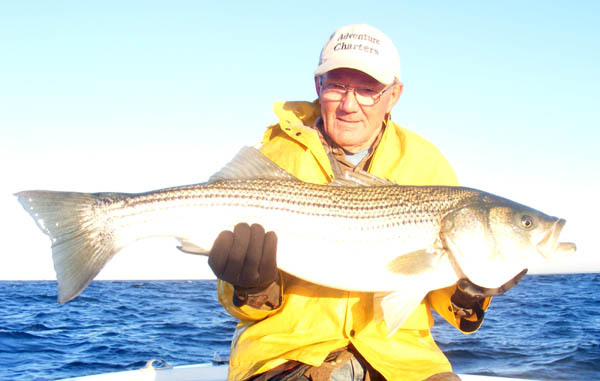 September 6, 2007: Captain Chris holds a beautiful Albie taken on a 10-weight fly rod. 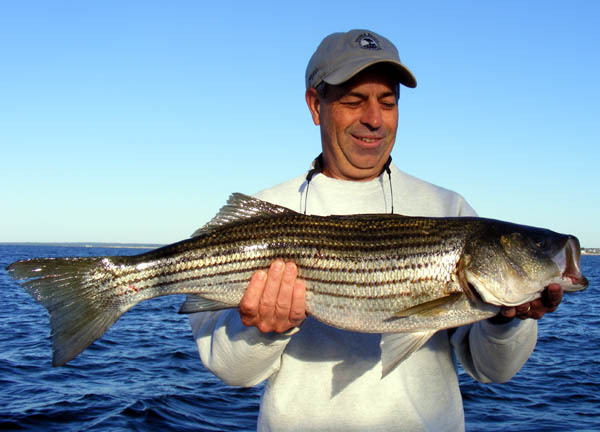 September 2, 2007: A beautiful 25lb Bass taken along the RI South shore. 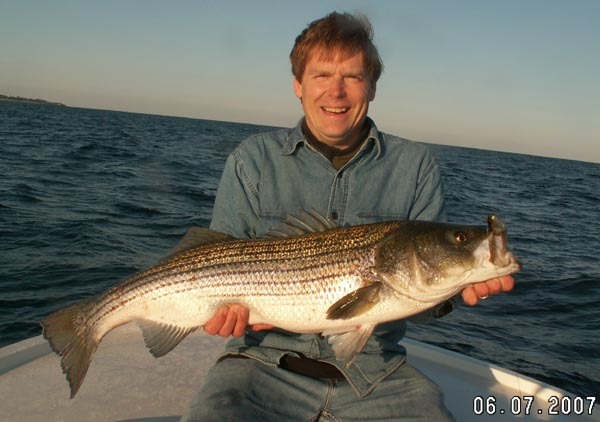 September 2, 2007: Brian holds a nice Bass caught along the South shore. 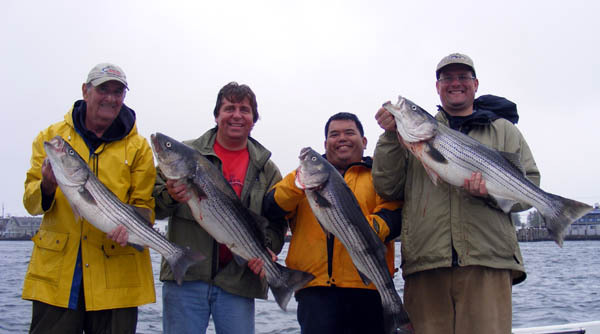 September 1, 2007: Some of the Bass caught on light tackle during this trip. 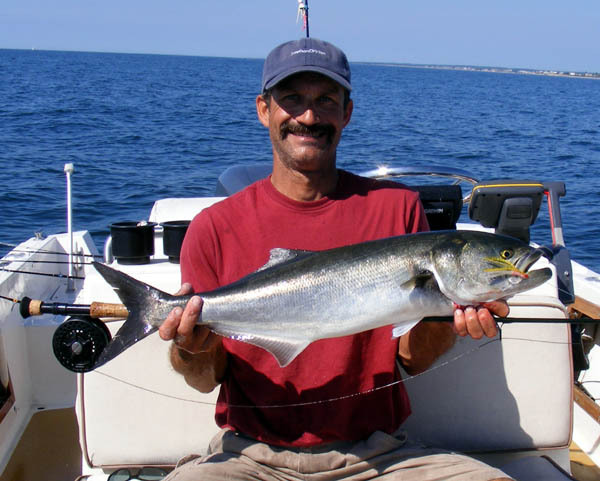 August 28, 2007: Captain Chris with a big Bluefish taken on an 8-weight Fly Rod. 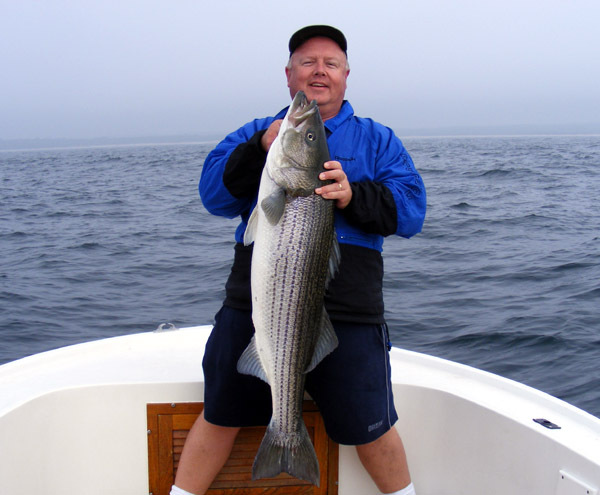 August 28, 2007: Captain Chris with a nice 20lb Bass taken on a 6" soft plastic shad. 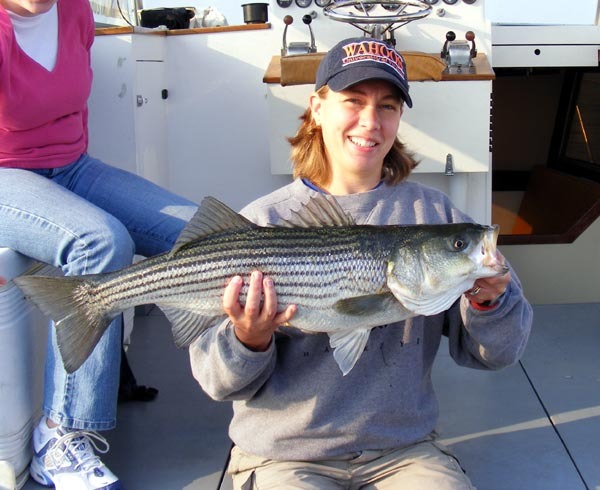 August 27, 2007: Kathy holds a nice 33" long Bass she brought in along the South shore. August 27, 2007: Mike holds a 27lb Cow taken on a plastic shad and a 12lb class rod. 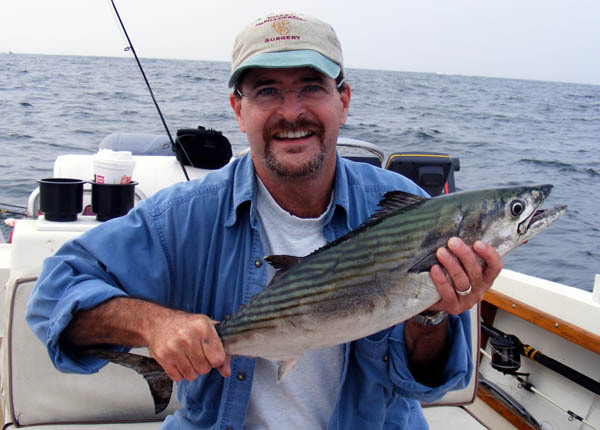 August 26, 2007: Scott holds a nice Bass taken on a white Bucktail along the South shore. 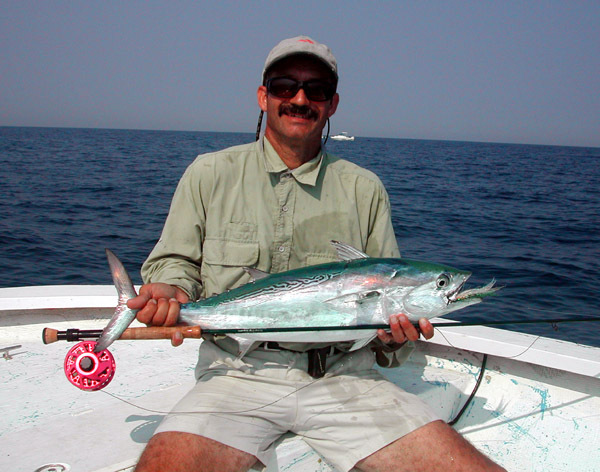 August 25th, 2007: Kevin holds his first hard-earned Bonito taken on a 12lb class rod. 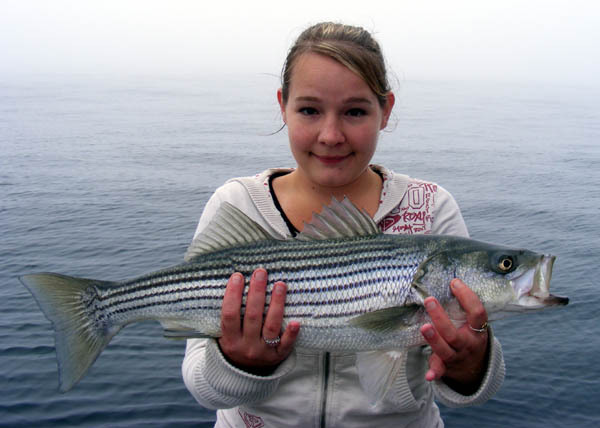 August 24, 2007: Marissa holds her first Striped Bass. 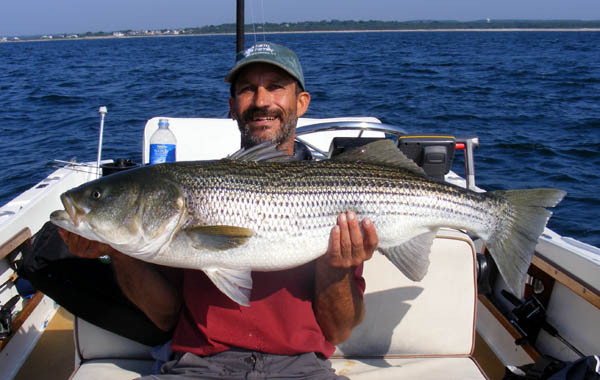 August 22, 2007: Mike holds a 19lb Bass caught along the RI South shore. 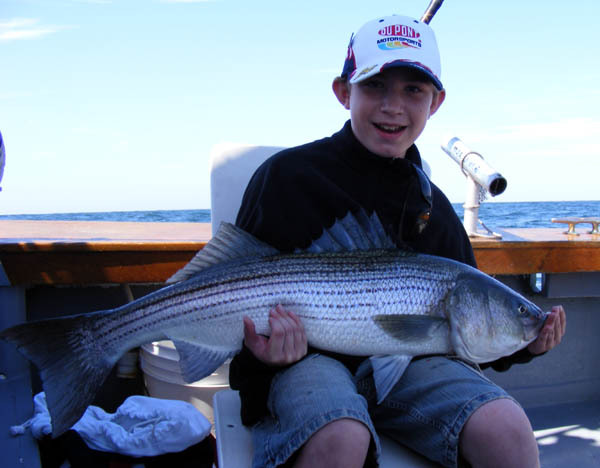 August 19, 2007: Zack holds a beautiful 32" Bass he caught. Zach released this Bass. 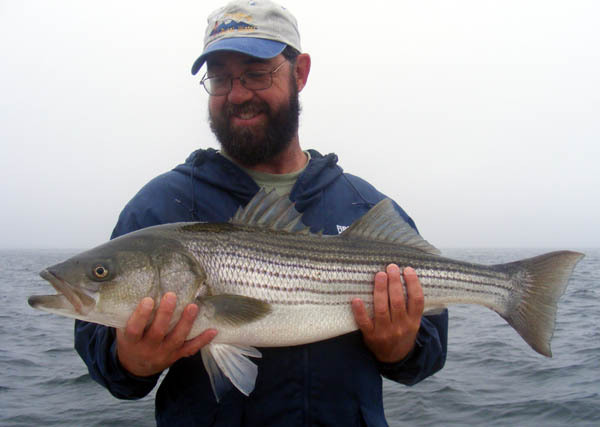 August 17, 2007: Nice Bass taken on Soft plastic at Block Island. 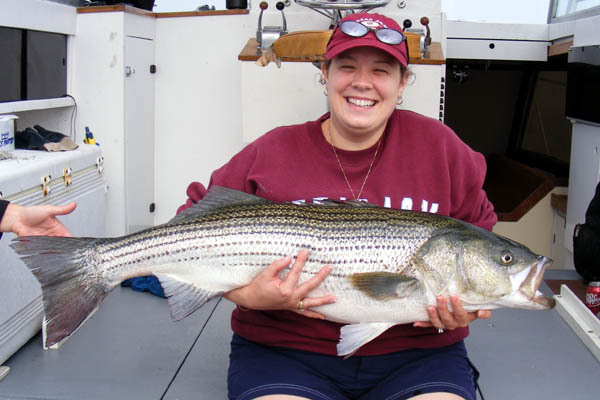 August 16, 2007: Lani proudly holds her 29LB bass caught at Block Island. 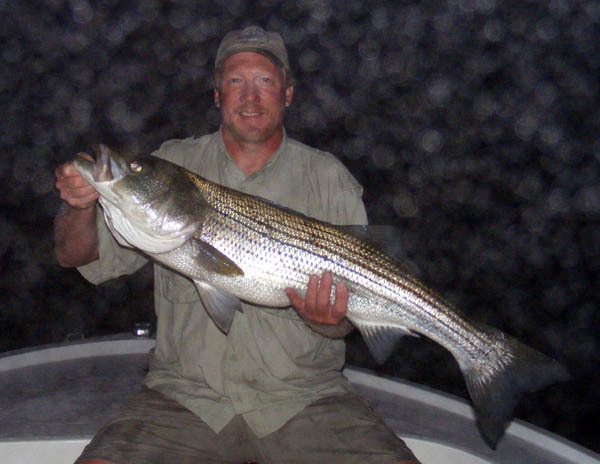 August 15, 2007: A massive 42lb Bass 49" long taken on a 17lb class rod. 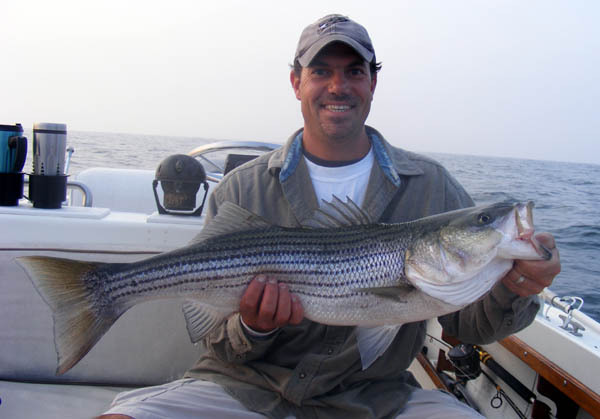 August 14, 2007: Jeff Ingber holds a nice 26lb Bass taken on a 17lb class rod. Caught 12 Bass, 11 Bluefish, and 20 flounder on this trip. This female Bass was released unharmed. 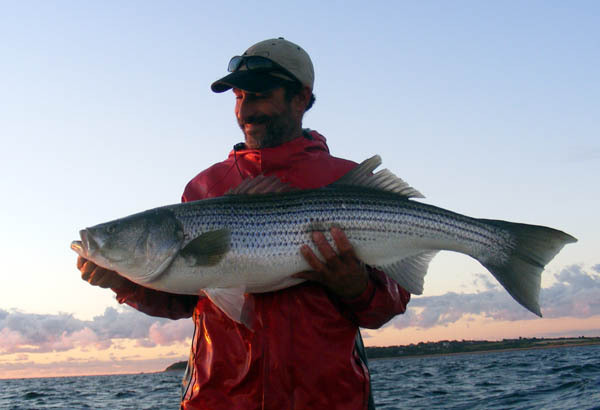 August 13, 2007: Brian Duffy holds a 27lb Bass taken on a 12lb class rod at Block Island. 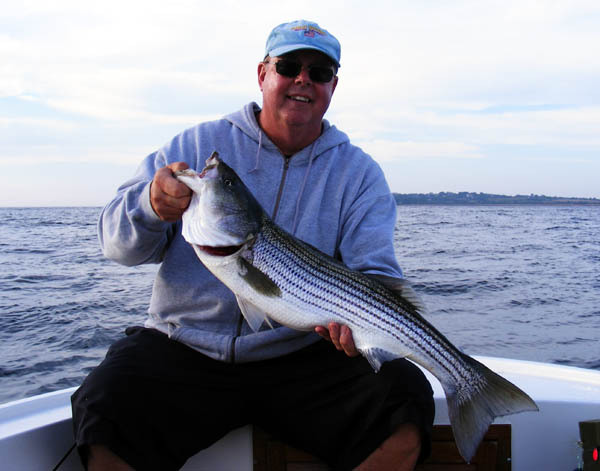 We caught 23 Bass, 2 Bluefish and 30 flounder on this trip. August 12, 2007: Beautiful 30Lb Bass caught during full day trip. 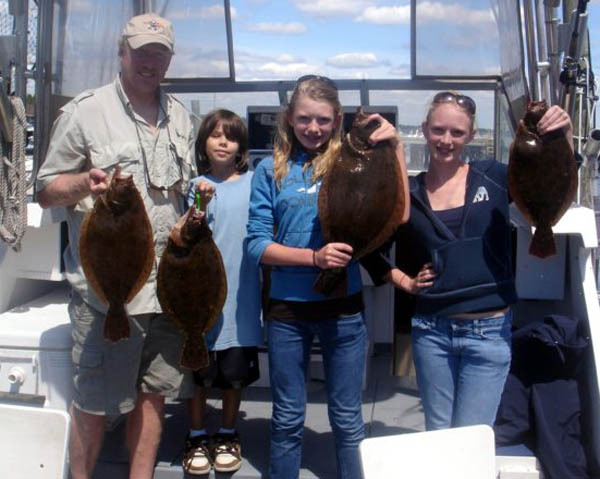 August 9, 2007: The O'Keefe Family Flounder fishing trip. 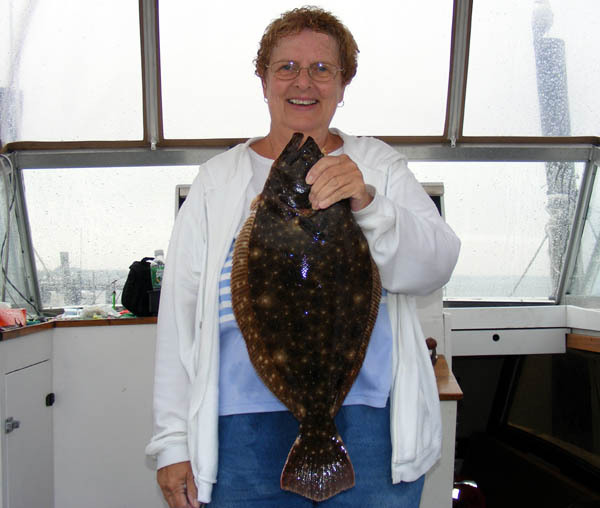 August 7, 2007: A nice 7lb Flounder caught during a half day flounder trip. 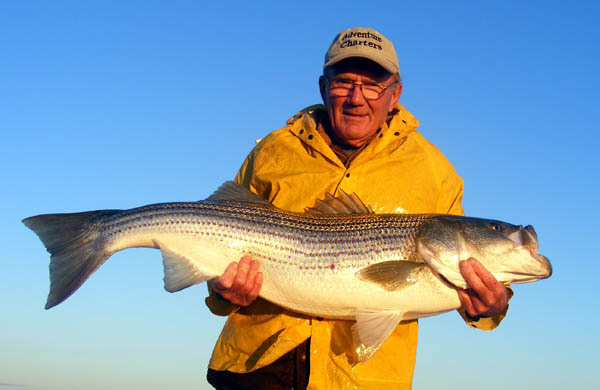 August 6, 2007: Michael O'Keefe holds a 28lb Bass taken on Light Tackle. 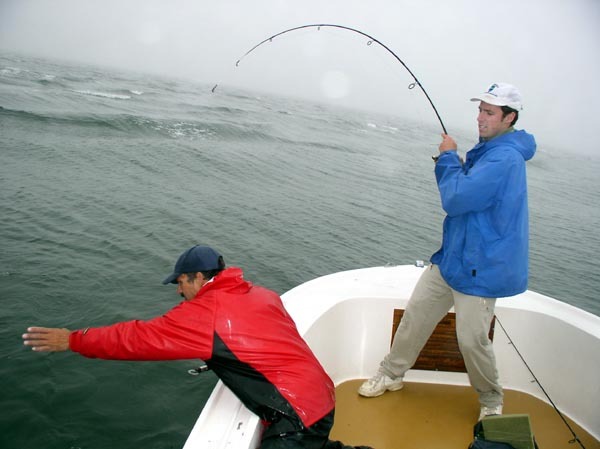 We caught 28 Bass and 2 Bluefish on this trip in the heavy fog. 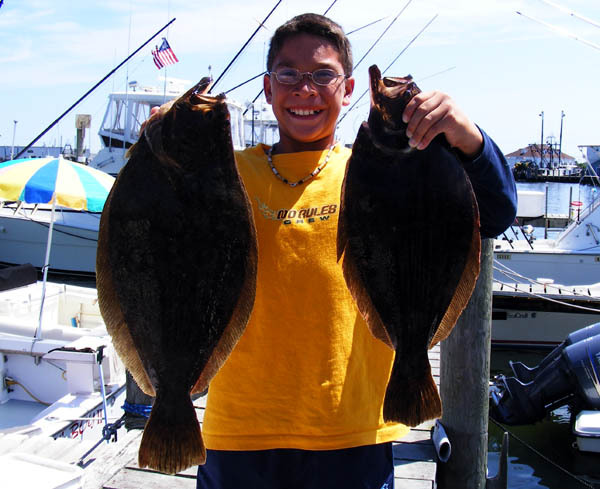 August 5, 2007: Zach holds two nice flounder caught during this trip. 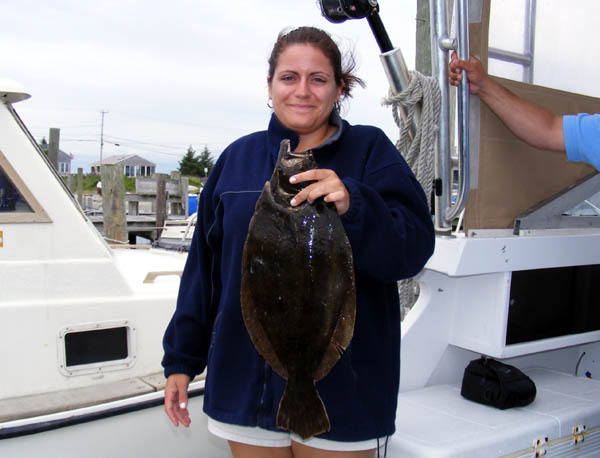 August 2, 2007: Jessica Leslie holds one of many flounder caught this day. August 1, 2007: Captain Chris with a 32lb Bass caught during Mako Light tackle trip. 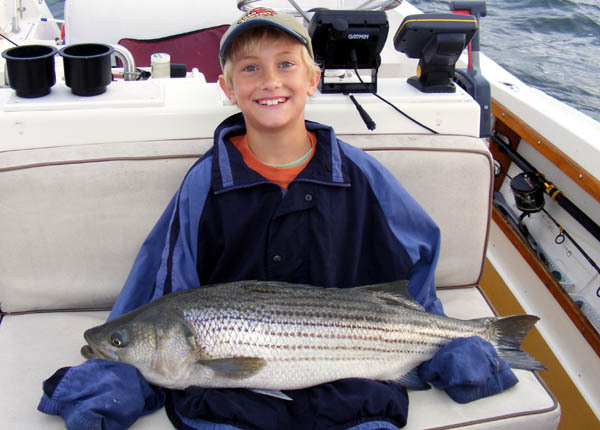 July 24, 2007: Nicholas Simpson holds the 22lb bass he caught. 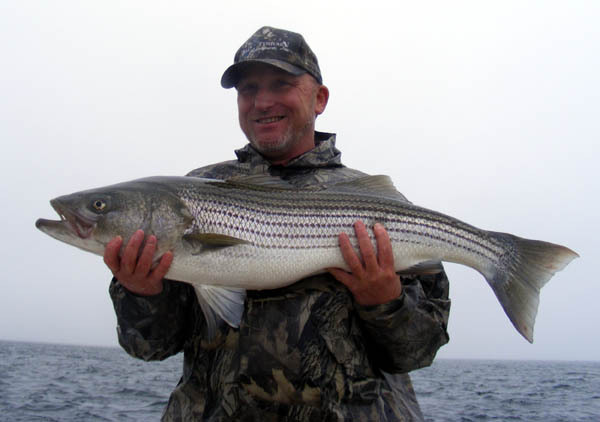 July 21, 2007: Robbie with a 22lb Bass, his own personal best striper ever caught. 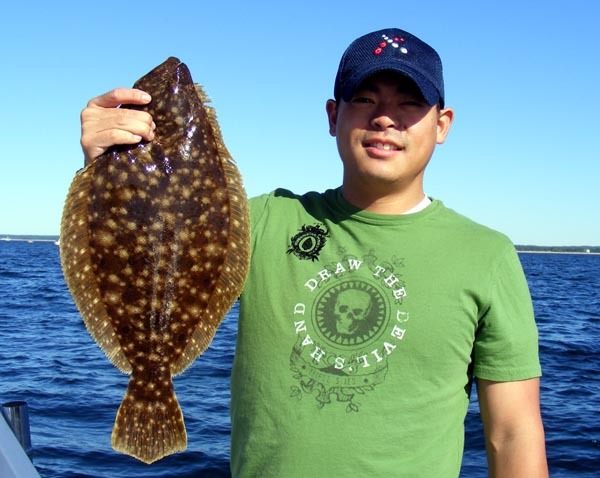 We got 17 Bass, 16 Bluefish and 45 Flounder on this trip. Rob released this Bass. 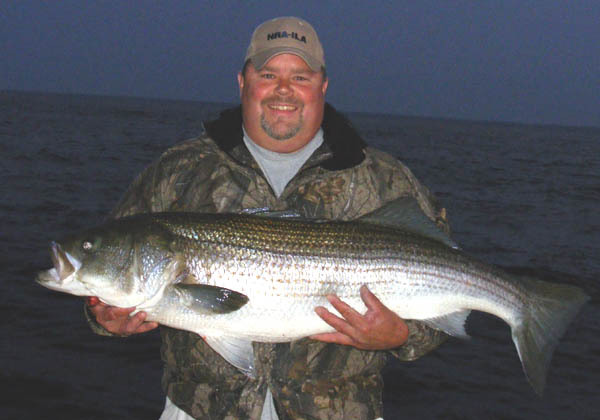 July 21, 2007: Clay with a 21lb Bass, his own Personal Best Striper ever caught. Clay chose to release this large female unharmed. 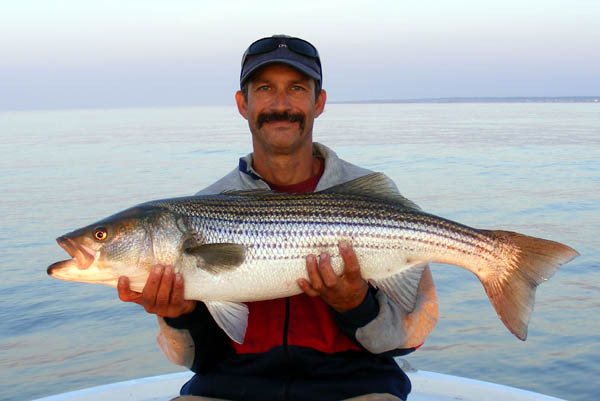 July 20, 2007: Captain Earl holds a nice 25lb Bass taken during light tackle trip. 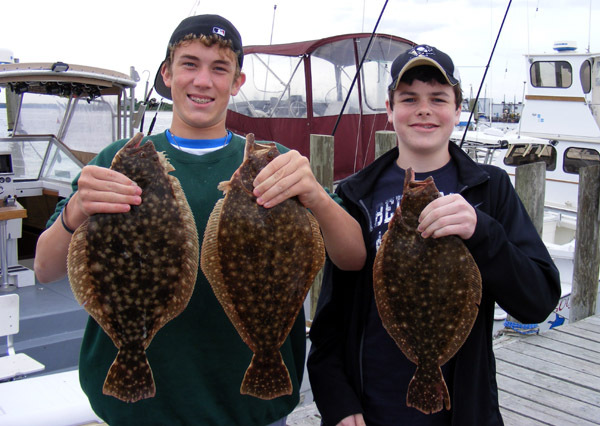 July 17, 2007: Half Day Flounder Trip Showing off some of their catch. 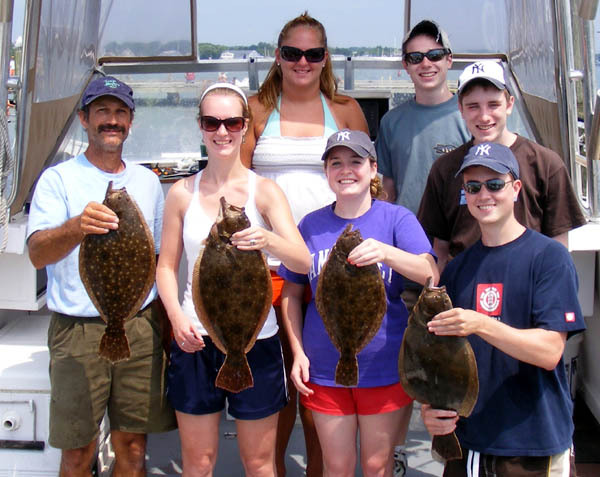 July 13, 2007: Some of the large flounder caught (total 68 for half day trip). 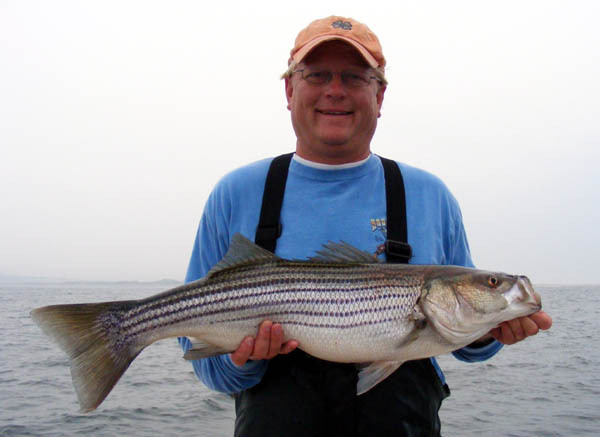 July 7, 2007 Tom Duffy holds a nice BI Bass taken on 12lb class tackle and a Storm jig. 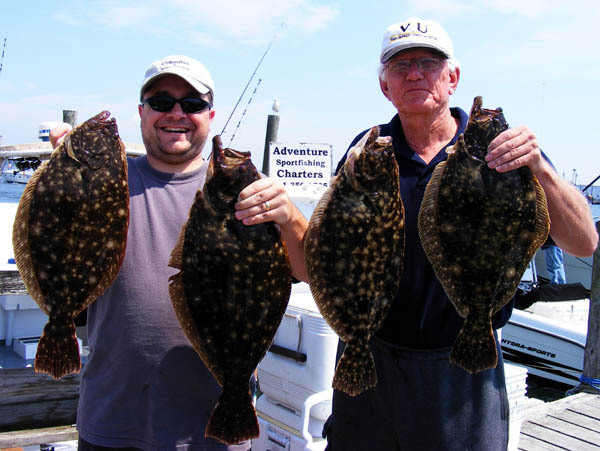 We caught 15 Bass, then went fluking and caught 30 flounder. See them hiding in the background? 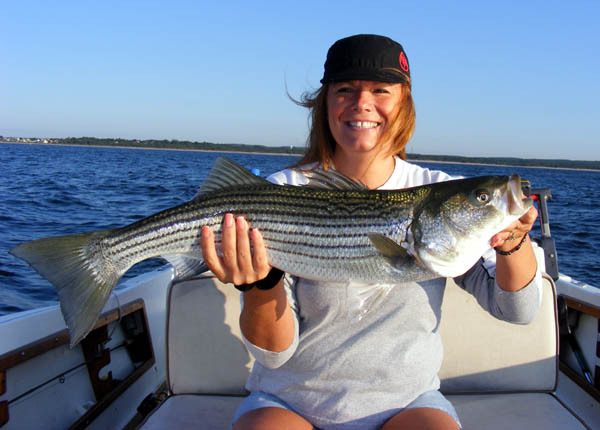 Kim was Slaying them, She caught the first, the most fish (19), and the biggest fish July 4th. This girl was just unstoppable. 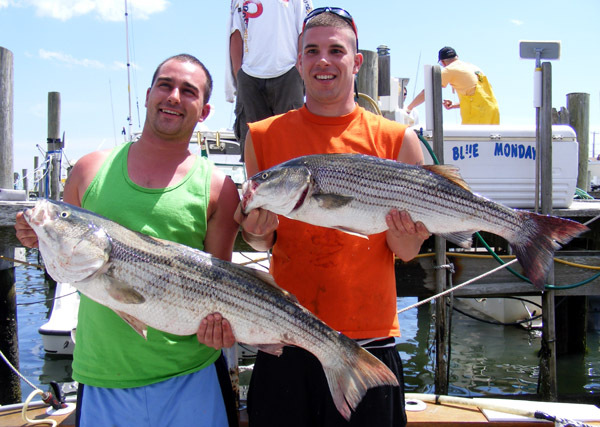 A 25lb and 15lb Bass taken June 30, 2007 (total 5 Bass, 25 Bluefish, 16 Flounder). 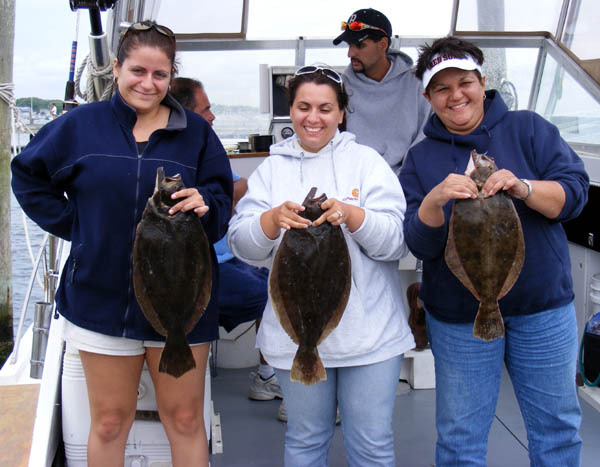 A few of the 38 Flounder caught during half day flounder trip on June 29, 2007. 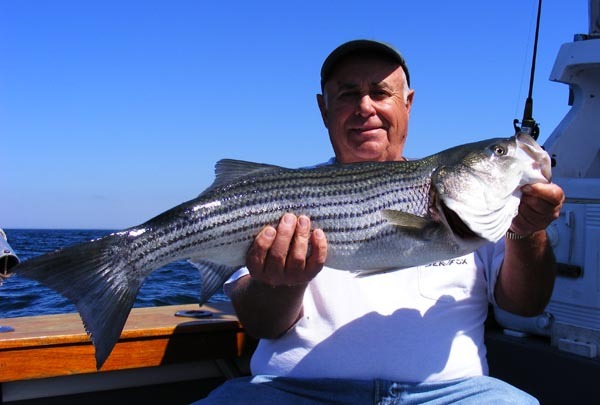 June 28, 2007 Bob Forsyth with a 45" 34lb Bass caught on the RI South Shore, his personal best. 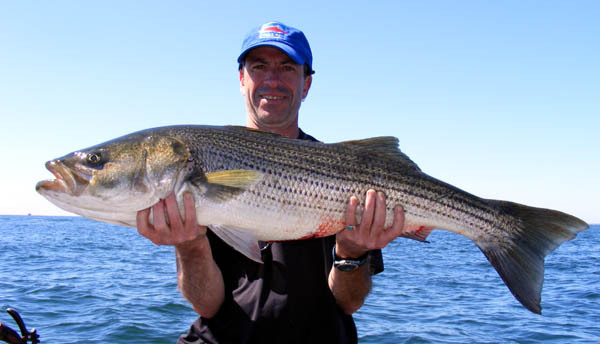 This fish was brought in on a 12lb class outfit, a very significant achievement. 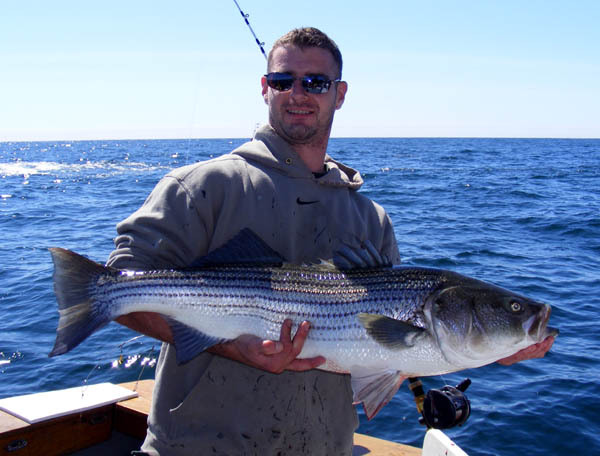 Captain Chris with a beautiful 51lb Bass 60" long caught RI South Shore June 28. Caught on a 12lb class outfit. This Large female was released unharmed. 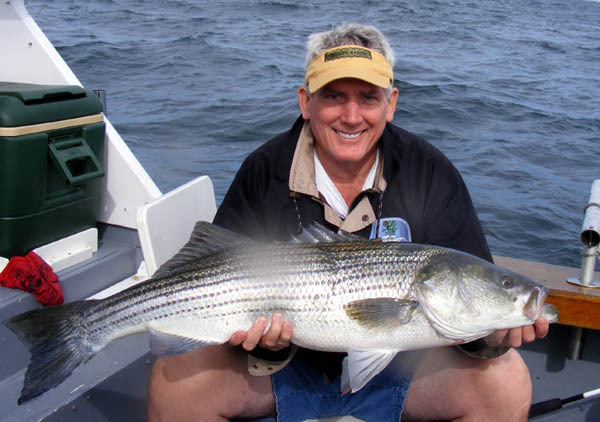 Captain Chris holds one of the Bass Joanie caught on June 26th. 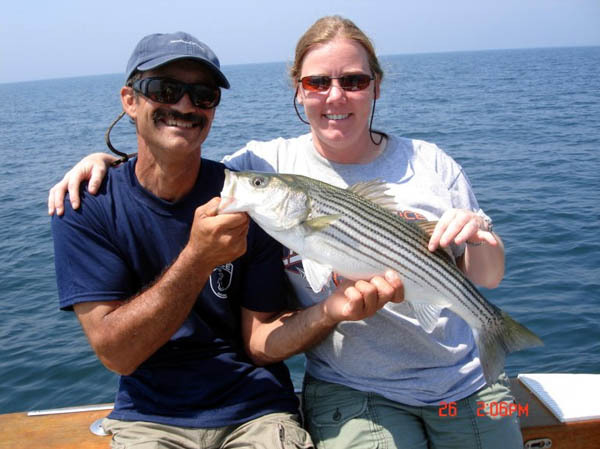 Captain Chris and Laurie with one of the Bass she caught on June 26th. 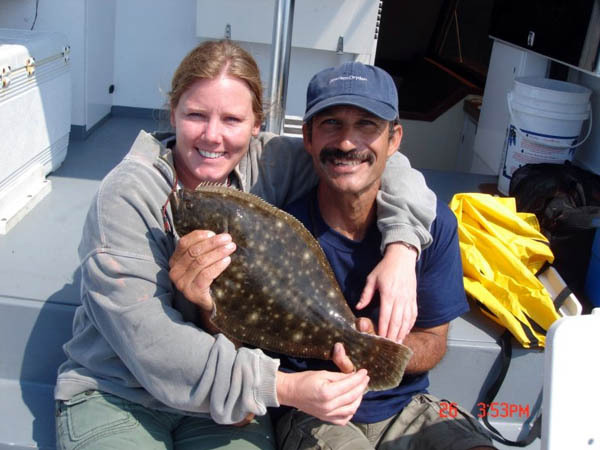 Captain Chris holds one of the 12 flounder Laurie caught by herself June 26th. 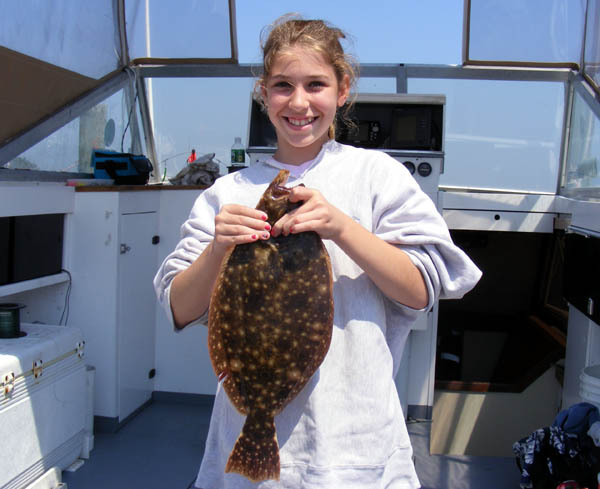 Abigail with her biggest flounder June 25, 2007 (she beat everyone, catching 16 fish). 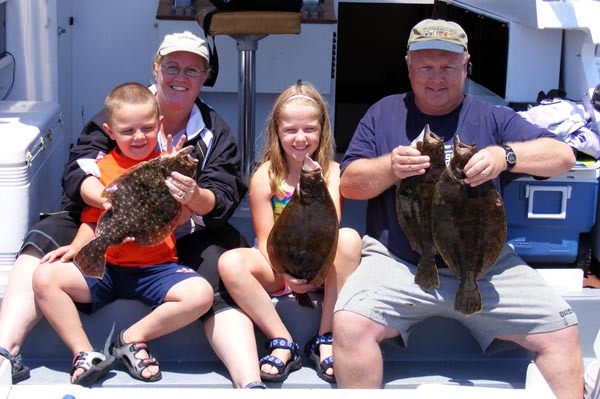 Bob Forsyth and his Family with some of the 54 flounder caught June 25, 2007. 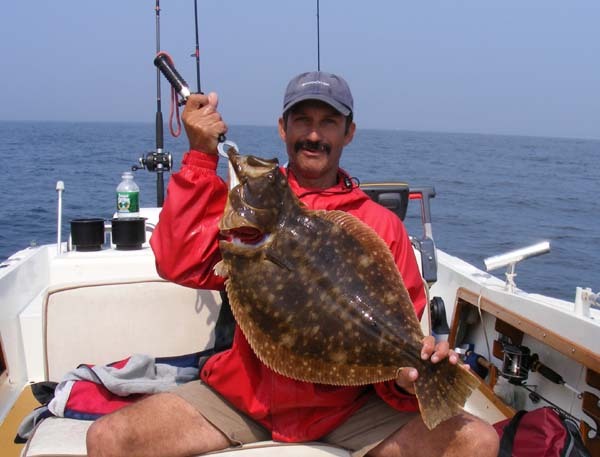 Doug Holds one of the 51 Flounder caught June 24, 2007 on a half Day Flounder trip. 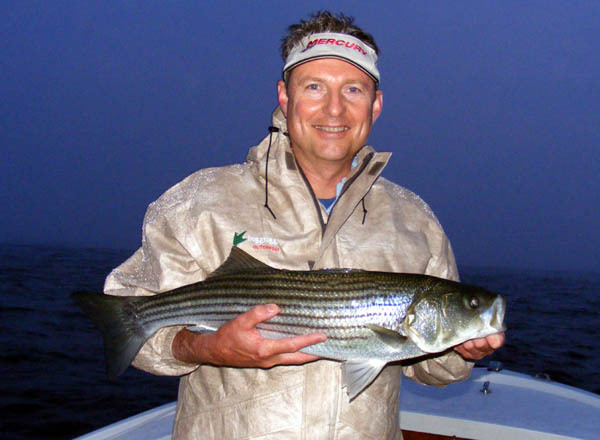 Brian Duffy brings in a Bass fishing in the fog and rain at Block Island. 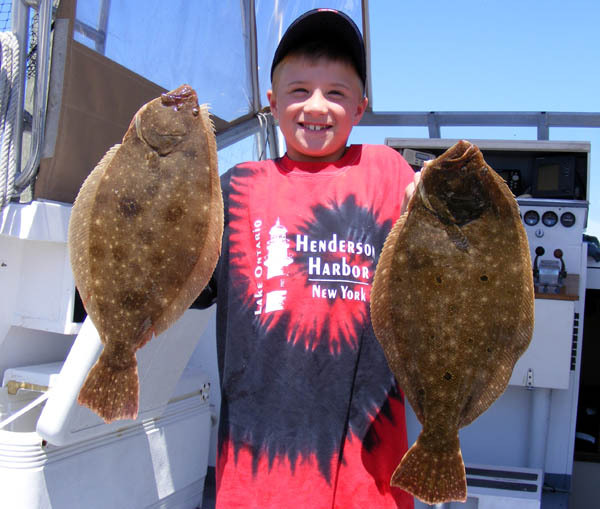 June 19, 2007 Aiden holds a 21" flounder he reeled in himself. Nice Job. 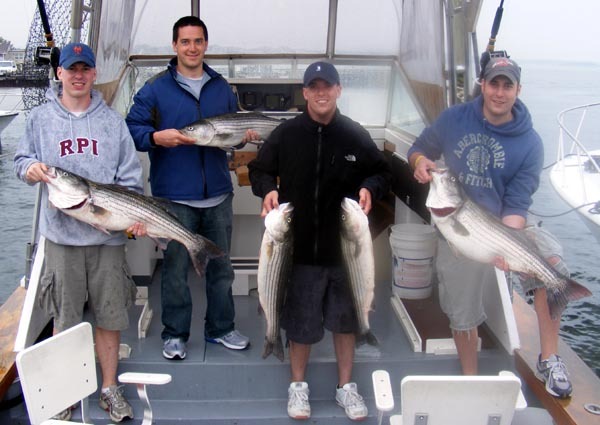 June 17th Bass Trip: Bass taken at Block Island. 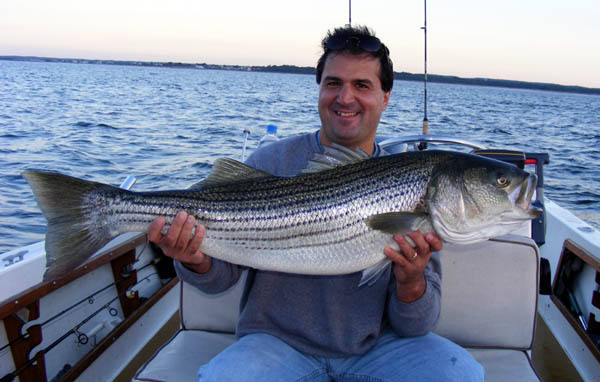 Gary Tedeschi was really excited about the morning bite that was going on June 8, 2007. 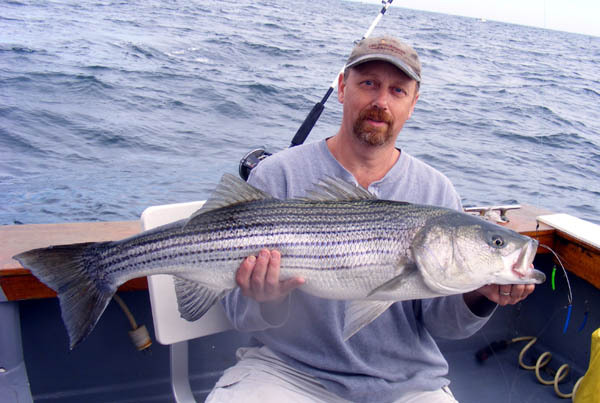 Nice Block Island Bass caught May 27, 2007 during light tackle trip. 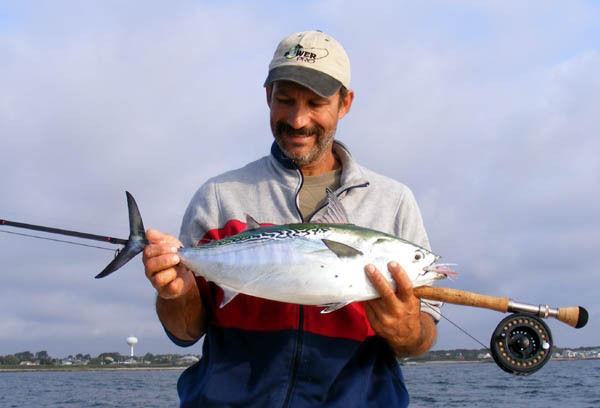 Nice False Albacore caught on the fly on April 27, 2007. 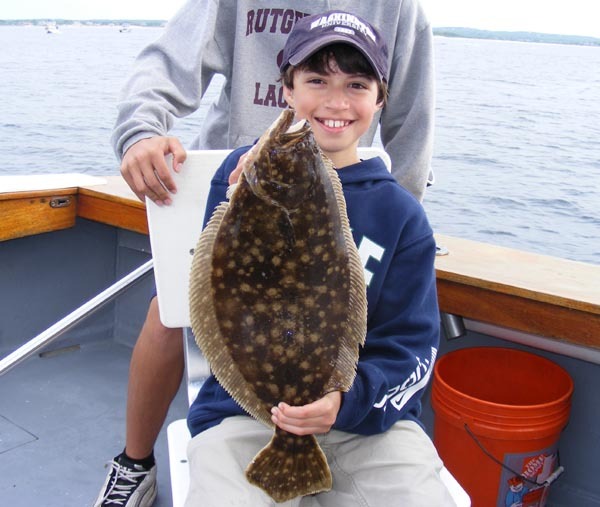 Copyright 2004-2008 Adventure Rhode Island Fishing Charters. All rights reserved.